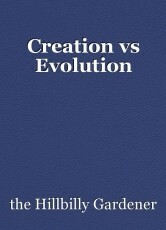 Creation and evolution can coexist as one belief, with both being correct but different. Why not Creation and Evolution as one? Each of us starts out life with one commonality; we didn’t just simply appear from out of nothingness as a sudden existence in time and space. From the very moment that the spark of our individual existence began, a complex set of processes were set in motion that are an extension of the processes that began with the very first beings that were to be called mankind. On these points, few will disagree. From this point, there can only be two logical avenues of thought possible: A) we are a part of a much greater and more intricate web of life that is embodied in all living life on this planet that is ever changing and adapting to be able to exist and co-exist together to the mutual benefit of all other species or B) we are separate and living apart from all other life, co-existing with but not a part of, all other life on this planet. This second choice of which, by necessity would make humanity strangers and aliens on this planet we call earth, as if placed here to passively enjoy, but not be a true part of this life. The first choice is much like being a key participant in a great play or ballet performance, instead of merely a spectator in the audience. The second is much the same as in viewing fine art; we enjoy the finished product, but we never partake in the process ourselves. At some point in our journey through life, many if not most of us, start to question and wonder about our origins and how we came to be. This is a normal and natural question, often attributed with children who have not yet had their inquisitive nature dampened. The answers to these questions and how we come to eventually believe is often dictated to us by parents, church, school, peers, and others or events that we find influential and many or perhaps most people, never question these beliefs that are dictated to us, which in the end often become the foundations upon which we build our belief system. These beliefs are thrust upon us as if there can be no other alternative and to consider otherwise is likened unto a moral sin for which we shall eternally pay dire consequences. Like animals – we are often driven toward one side or the other when we are younger, with little chance to explore the options, evaluate each side or viewpoint, and make up our own mind. Then when we are older, and because of the source of that belief and our trust in that source, we simply take them as fact and go about our lives, eventually teaching them to our offspring as we were taught, and therefore we continue the cycle generation after generation, until something causes us to question the source of that original belief. I grew up in a strict Southern Baptist home with an extremely narrow and strict interpretation of the Bible and the moral disciplines. In such an atmosphere, it is difficult to question or explore alternatives to that viewpoint openly. No other possibility existed; to question the accuracy or validity of the belief one was taught was viewed something akin to heresy of the Bible. In order to do so, one had to carry out ones inquisitive nature in clandestine secrecy for fear of being discovered and risk being condemned to the fiery pits of Hell. Therefore, a strict and literal interpretation of the Bible is a natural belief to carry into adulthood, and will remain the dominant belief unless a person finds a reason to question that belief and explore other possibilities. This situation is far too common with many people and is especially prevalent among those who have any religious convictions and is easily borne out by paying attention to what people have to say. People are quick to unknowingly give away many foundational secrets about themselves if one will but listen intently. Further into our journey through life and as we start to mature, most of us start to divide into groups based on common beliefs. As we migrate toward a particular belief whether right or left, many people also start to build walls behind our beliefs so that the beliefs and views of the opposing side cannot become influential in our lives and pose a threat to what we believe. We start to believe what we believe and nothing else exists, and we will fight vehemently to protect that belief. When a perceived threat to our belief comes along, we simply withdraw into our comfortable and often flawed beliefs, much like a turtle withdrawing into its shell and view the outside world through the tiny slit of an opening in its shell; never getting a good look at what it is that it believes is threatening it. This is the foolishness of humanity and exemplifies its acute ability at two-dimensional thinking. Only the human species has the ability to think and to reason without prompting, yet by its own choosing, often chooses to go through life with blinders on and the door of our mind shut tight against the outside world. Of the members of the animal kingdom, this is expected, but of humans, this is folly. Sometimes, the act of deliberately choosing not to be forced to choose between the right or the left and making a choice instead, that embraces both views, is the right choice. This is the folly and downfall of the average non-critically thinking human; who considers that there are but only two possibilities to an issue and allows himself or herself to be drawn into one side or the other. This is the “true crime” as it were. It does not matter whether there is any truth or validity in either side or how much; it is now a matter of personal values and personal beliefs. In our quest to stand on the side of truth, it is often truth itself that suffers the most: it is truth itself that ends up lying bloodied and beaten somewhere in the middle, suspended unseen somewhere between two opposing and battling forces. For many, to consider one is an open attack upon the other. What the facts are is irrelevant. Myth and conjecture are often more influential, relevant and real to many people than the facts are. This is not unlike a parent settling a dispute between two squabbling siblings and applying punishment without gathering all of the facts and applying intelligent intuition and judgment. When this happens, it is inevitable that improper and often rash decisions will be made and wrongful punishment will be handed out. Therefore, the real challenge is to avoid the temptation to be drawn into any singular belief because of the influence or teaching of any singular outside influence and choose rather to base one’s belief on the best evidence available by careful and unbiased consideration and examination of all views. If there is truth in ones belief, do not fear the other beliefs, embrace and welcome them for yours will stand on its own merits. If it cannot withstand careful scrutiny and a perceived attack by an opposing view, perhaps it or your perception and understanding of it, are flawed to begin with. This should not in any way be construed as to mean that one should not have beliefs as an easy and convenient escape from an outside attack by others, especially those beliefs of a religious nature. Religious beliefs are the foundational elements of humanity that ground and anchor us and tie us to something much greater than ourselves. They fulfill a need in our own lives that make us complete. Our beliefs give us a feeling of self worth and a motivation to move beyond ourselves to strive to be something better than who and what we are. They give us a hope for the future beyond what we know now, and an assurance that what we are doing counts for something greater than ourselves. Each of us is conceived and hardwired at conception with an inherent need and tendency toward such beliefs; the lack of any beliefs is a self-denial that one must personally learn and practice in order to achieve. It is my belief, that the need for a religious belief in something much greater than ourselves is a primary factor that has spawned so many diverse religions among the many peoples of this world. But, one must be careful that they interpret, understand and apply those beliefs properly. Properly applied beliefs can enrich us and make us and others around us grow, while improperly applied beliefs can cause us to be blind, closed minded and destructive to ourselves and others. A strict adherence to a rigid set of religious ideals and beliefs without a thorough understanding and testing of the underlying truths and meanings of those beliefs can lead to many false beliefs and false assumptions which inevitably only serve to undermine the very religion a person holds most dear. Improperly applied religious beliefs can drive others away from ours and into the beliefs of another view. For any belief to be real and true, it must be tested and refined; much like gold and precious metals are tested and purified by the fires of the furnace. What comes out of the furnace is more pure and more valuable than what went in. One such example of a widely held, errant and closed-minded belief was the widely held view of the world as being flat. This once common view, which seems so childish several hundred years later, was once universally accepted and still being held as the solid truth by many leaders of the Christian church, upon which many people staked their very lives, as late as 1492, when Columbus made his historic voyage (Flat Earth). This once widely held belief had largely been disproved by the scientific community and practical experience by sailors and the idea of the world being round was widely accepted as true by the majority of the known world by this time, even though many refused to accept it, regardless of the facts. belief held by another person who does not believe in these things. To the person that believes in such things that others might be inclined to call “superstition”, they can and often will be inclined to cite case after case of experiences to prove the rational of what they believe. Does this in any way make these beliefs more or less true? Does my disbelief and argument against them make them any less real to those who do believe them to be true? Because I do not believe, can I prove that their belief is not true? In one case, science may be able to prove that there is a lack of tangible existence. On the other hand it must be maintained as possible, that just because we cannot prove otherwise, intangible forces that cannot be proven by any known scientific method could exist? A philosophical dilemma exists when a person who believes in an intangible thing cannot prove that it exists and I cannot prove that the same intangible thing does not exist. Therefore, a reasonable assumption must be drawn from the evidence from both extremes; two sides, two arguments and beliefs, possibly both right and both wrong. 30% of respondents stated they were Creationists, while 9% stated they were Evolutionists in their beliefs. Of this number, 51% stated that the origins of their Creationist belief lay in the teachings of their parents or church and not in a critical thinking process. Of the number who stated they believed in Evolution, the number that came to that opinion as a result of a critical thinking process was 27%. As stated in Genesis, God created a singular man (Ryrie NAS Bible, Gen. 1:26-28) and a singular woman. This cannot be interpreted any other way than to mean a single race of a single skin color and singular physical features. Yet today, we have many different races of many skin colors and physical features. How did this come about, why and by what processes did this occur? These are questions that the Evolutionist seeks to answer. God had apparent created perfect order, without plants of great pain and discomfort. After the fall of man, as presented in the Bible (Gen. 3:18), thorns and thistles appeared to spoil the perfect creation of God. This would be a change that the evolutionist is interested in as it suggests the appearance of new plants on earth. With only 2 of every animal known to man in recorded history (there were more than 2 of some) and no provisions included, placed inside the ark side by side so that there was no room to move there would still not be enough room inside the ark for all of the known animals, reptiles and birds. Where did the others come from? There is no evidence given in the Bible that God went through another creation period. This also does not account for the vast diversity of animal life, nor does it account for the insects, which there is no indication were a part of the ark at all. Where did they come from and how? possibility of surviving. Yet today, we have billions of species of plants covering this planet and many of them are not of any form or species that could have survived the great flood. Therefore, where did such diversity and abundance of plant life come from and how? After the flood, there is the first evidence (according to the Bible) of an evolutionary process induced by an outside force, when God caused the animals to fear man (Gen. 9). This had not been a part of creation before; when according to the Bible the animals lived in harmony with man. It is still an evolutionary process. A comparison of humans of today to the humans of Jesus day and before, and especially the mummies of the Egyptian kings mentioned in the Bible, of which there has been much study, shows that modern humans of today are physically different and much larger than they were in years past. Evolutionary change again. Why did this occur, and by what processes could it have happened? These are all things that the Evolutionist seeks to answer. The Creationist does not deny these things; they simply choose not to acknowledge them. All of the above foundational stories from the Bible I, like so many other people that call themselves Creationists, have heard from our youth and can recite them from memory. Yet like most, we had the details presented in such a way that they were never something to consider as anything other than a factual part of the story and were simply something to be taken literally. Whether in various surveys, editorials, published articles or in casual conversations, there are often common lines of thought that rise to the surface, all quite personal, highly noble and show a deep conviction of belief, but at the same time show an apparent level of closed mindedness and a stubborn level of devotion to a set of principles and thoughts that apparently have not been well considered or explored. Their rational and arguments bear up to scrutiny and examination like castles of sand against the waves of an ocean. Note the obvious reference to “the Creator” and not simply a Creator; a personal, rather than an ambiguous and disconnected reference to a higher power. This is not a statement that would be made lightly in a public writing by a person who was an atheist, not to mention the fact that to even admit the existence of a non-verifiable entity in a scientific writing, prone to scrutiny both publicly and by his peers in the scientific community, was a pretty bold statement in itself, especial in the 19th century scientific community, where adherence to strict scientific protocols was much more stringently expected and adhered to. However, for obvious reasons Darwin like most people involved in any science, stops short of naming any single deity by name. Obviously there is no proof that a deity even exists, nor is there proof of which deity to give credit to even if there is. It should also be noted before attributing credit to Darwin for being the father of modern evolution, that while Charles Darwin wrote extensively on the area of natural selection, with an implied emphasis on evolution and natural selection (closely related fields), and is admittedly the best known of all of the naturalist scientists and authors for a variety of reasons, a great deal of his writings and the material for his writings came from and had their origins in the writings of other prominent natural selection researchers, both of his day and those who had started work before him. Much of his work built upon the work that they had already started. Referring back to the same survey again, the question of whether or not evolution is a science continues to be an issue. Another point that many cite for discounting evolution as being credible, is that it is based on “theory” (17% of respondents). Considering that the beginning of finding the solution to many problems, whether scientific or lay, begins with a theory that appears to fit the elements of the problem or situation to be solved and many sciences, such as physics, astronomy, aeronautics and even medicine, which of these shall we also discount? We could discount physics. But then we would have to also discount physicists such as Einstein as a delusional crackpot and throw out all that has occurred because of the advances of his theories and those like him. Space travel would not have occurred and we never would have landed on the moon. We could discount astronomy, because there’s no reason to know about distant stars and plants. After all, until we actually land on one, we can’t prove they actually exist. The signals we hear in our radio telescopes could be static from some distant thunderstorm and the lights we see in our telescopes could be reflections from some distant light refracted off moisture or dust in the air. Aeronautics, and air flight is a hoax! The Wright Brothers were radical nonconformists anyway. It’s impossible for something as big and heavy as a 747 to fly! But then too, someone failed to teach aeronautics and physics to the Bumblebee, who by some unexplainable evolutionary process flies, even though by all of the laws of physics we currently know, is impossible. How about medicine, that’s been a big lie from the start. Scientists like Van Leeuwenhoek, Louis Pasteur, Jonas Salk were nothing more than Witch Doctors operating with the guidance of crystal balls a tarot cards. All of the above statements are absurd aren’t they? Yet they each follow the same line of reasoning that many creationists present as arguments today. Yet in all of these cases, the results started out with the recognition of a set of parameters that begged and answer, to which theories were applied. These theories gave researchers a place to start and provided a suggested method by which they would proceed. The same holds true with evolution. change that by every identifiable measure is radical. It is a science that deals with tangible evidence that often must be sought after and found, like pieces of a puzzle. There is strong evidence to indicate what the picture will be, but pieces are often missing that leaves out much detail. Therefore, holes do exist that may never be filled with irrefutable evidence. As anyone who puts together puzzles knows, one need not have all of the pieces to know what the overall picture will be. But in the missing pieces, many of the details may lie. Recently, fossils remains of giant ants that were as large as Hummingbirds were found in Montana in the United States and in Germany that lived approximately 50 million years ago (March). This begs two possible scenarios: A) Since the creationist claims that evolution does not exist, these fossils had to be placed there by the creator as a hoax or B) ants, like other insects were created, but underwent some great change. If “B” is correct, the evolutionist wishes to understand and if possible, explain why and how this change occurred. This is evidence of the dilemma. On the one hand, one side claiming that evolution doesn’t exist and the study of it is not a science. On the other hand, another side is seeing the evidence in front of them of what was and what is and wants to know how and why. When it comes to science in general, it is good and necessary to operate by a set of disciplines. Otherwise there would be chaos and science would be meaningless. There would be no definition or direction and anything could be considered to be the truth, or nothing could be the truth. Yet, there comes a time in any discipline when the situation does not fit the discipline. This may be the case with evolution. Normally, the consideration of that which is not provable is not considered as part of the process. This by itself would not be an issue with most of the sciences, but evolution is far from an ordinary science. For the creationist, often nothing but an open proclamation of a creator as the source of creation is acceptable. For the evolutionist, the acceptance and proclamation of that which cannot be proven, goes against the disciplines by which he or she has been taught and normally abides. However, the possibility exists that changes can occur that require a change or modification in the discipline by which the researcher operates. The evolution scientist studies the changes that occur within a given species and among various species. They see the vast array of species and the intricate balance and interrelation between them; they can see the evidence of a species that has been and a similar species that exists today. Yet through all of this, they all too often fail to recognize or come to the conclusion that all of creation had to be created by a power much greater than the whole of humanity, regardless of the fact that the existence of a creator cannot be proven. To look at creation and evolution from a purely logical perspective, it is a logical conclusion that all that exists must have a beginning; and what existed before the beginning must by its very nature, be greater than what will exist when time itself ceases to exist? The creator of anything cannot be less than the sum total of all that will exist at the end of the life of the thing. To think otherwise cannot stand the test of logical reasoning. But, to deny the possibility that that same creation can exist in an intricate and constantly changing variety of forms that may be explainable is equally illogical, when a multitude of evidence exists to strongly suggest this is the case. Perhaps the greatest challenges that face both Creationism and Evolution are these. For creationists, theirs are views that are totally improvable in any way. There can be no doubt that they truly believe what they say they believe, and that the entire concept of creation as they tell it is as real to them as anything else. However, their views are not even universal among themselves, and great inconsistencies exist among them. By their individuality and diversity of beliefs, they weaken their own cause overall. The only thing that appears to be somewhat universal is their belief that a deity created all that exists. But, that begs the question who’s deity? This is perhaps the most challenging of all realizations of all for a creationist, the realization that while they may believe strongly that their deity individual deity is the creator of all things, and to them their deity may be as real as any tangible object to them, the deity that they worship and give credit for creation to, is not the same deity that all peoples of the world worship. Each culture and religion also has their beliefs regarding the origins of creation, and many of them also call themselves creationists. Therefore, whose deity should be supported? Creationists are not even universally united on the meaning that they pour into the deity that they worship. The God that I worship and I might demand that creation to be credited to, may not be the deity that my neighbor worships. At least on this point, Bible scholars of this day can and do usually agree. This appears to be a phenomenon most often associated with modern Christianity, and it is within modern Christianity that the most division in creationism appears to lie. A critical and open-minded study of the Bible does indeed leave open a credible argument for the basis of evolution; but Christians, of whom many creationists claim to be, make many claims as to the awesome power and ability of God, yet choose to place limits around how that endeavor could have been accomplished. This is vastly inconsistent with the evidence which has been placed right in front of them every day, even without considering any other tangible evidence, such as fossil records. This evidence which evolutionists make an attempt to explain and understand, the creationist does not deny, but rather largely refuses to acknowledge in any way. This can only lead to the logical assumption that if they were to acknowledge the fossil records and other obvious evolutionary changes that are all around us, that it would lead to a perceived challenge to their long held beliefs and that perhaps a “Creator” could have indeed created a process much is more miraculous and wondrous than they ever considered. This would be a challenge to not only their long held beliefs, but also the source of those beliefs and a challenge to their comfort zone to which they tightly cling. But, this ultimately would prove that the Creator that they claim to be so awesomely powerful and complex is indeed much more powerful and complex than they ever imagined. This would inevitably lead them to being forced to let go of that little string of control they maintain over their creator and just how much power they allow their concept of a creator to have. There have been many advances in evolution science since Darwin’s day that have provided even greater evidence that ours is an intricate web of many species of life that are woven together that has existed for millennia and is still continuing today. The attitudes toward “provability” are changing as well, as more and more researchers probing the origins of our existence come to the conclusion that there has to be a power greater than ourselves at work. If this is to be true, then it by necessity will be an existence than transcends physicality as we currently know and understand it. For the Evolutionist, a study of the entirety of creation, with all of its complexity, while admittedly having obvious holes and gaps which leave incomplete information, has revealed an order and natural progression that cannot be accomplished any other way, other than by a force or intelligence much more powerful than any that exists on earth. Such phrases as “intelligent design” and “creator” are more common within scientific communities than they once were and there are increasing numbers of creationists daring to explore the possibility that their creator may be much more than they were originally taught. But creationists often place the evolutionist on a tightrope and will accept nothing less than the open and public proclamation of a deity as the creator, but which deity? All major religions have a deity and a version of creation. Each major religion claims to be the “true” or “right” religion. Which deity is correct for the evolutionist to declare as the true creator? What evidence could be presented to support the claims? To declare a singular deity without any substantive evidence of even the existence of one, let alone which one, ultimately puts the traditional scientific process at odds with itself, which is designed to be blind to that which is not provable, which dictates that some form of evidence to substantiate the findings or declaration be present. This is much the same concept that is held in our law, which is considered the fairest and best method to have for all parties, unless you are on the losing end of a judgment or named as the one being accused of something. Then it is often viewed as being extremely biased and as a tool to be used by someone else to attack you as an individual. I recalled an encounter I had with a tree; to some, it was just an ordinary tree. But this tree was different somehow, a mighty oak, whose canopy was huge and spread in a nearly perfect dome that covered an immense area; and out of the very center of the top of the tree rose one branch to stand in stately erect form, above the rest of the tree. As I studied the tree for a moment, I noted that each branch led off from another branch, much the same as the branch it led off from, but different in its own way, and from that branch, new branches emerged. Along each branch and unseen, were many buds waiting to become branches of their own, just as the others had done. Each of these and the exact placement of each bud were dictated by the intricate genetic code that had been so carefully put together and locked away inside that acorn so many years ago to emerge at a precise time and in a precise order. I stepped back to ponder again, the lone single branch that had become the strong central leader of the tree, to rise above all of the rest of the branches of the tree. As I studied it for a moment, I noticed that it, like the other branches, was not a singular branch rising from the ground, but rather had waited and taken its turn branching off from another branch deep within the tree, yet it had risen to take prominence above all of the rest. As I stepped away from the tree, I was able to see clearly how all of the branches led back down in orderly fashion to a single point where finally the tree met the ground, which gave it anchorage, life and nourishment. As I pondered these things, it became clear to me that this was the basis of what the true evolutionist had been trying to say all along. From one source, came many forms. Knowing that the most illogical assumption that any human can make is to assume that such intricacy, such precision and such order is not possible by any random chance and that there is no logical science that can rationalize the existence of something from nothing, I came to the realization that my belief in a creator is indeed well founded and it is evidenced in the processes of evolution. But I came to much more on that day, I experienced what the closed minded of both sides can never experience or know, that the God that I worship and serve is much greater, much wiser, much more powerful and complex than anything I had ever been taught before. I learned that the God I serve is not simply a magician that can make a Playdough® man, give him some mouth-to-mouth resuscitation and a man starts walking around. The God that I serve didn’t simply wave a magic wand over a hat and pour out all that has been created like some cheap sidewalk illusionist, like the God of the stories I had heard so many times before. The God that I serve had taken the time to painstakingly plan each and every element and process that would make up creation. The God that I serve had labored long over each detail of how and when each process would occur and each species that would appear and how long they would remain on this earth. The God that I serve, allowed his carefully planned and created processes to be set in motion and at a time of his choosing, breathed on a branch of that mighty oak called creation, and caused a new branch to form that would forever be set apart and different, to rise above all of the others. It makes no difference upon which branch he breathed, whether bird, fish, amoeba or primate. The only thing that matters is that the God that I serve cared enough about a particular species we call humans to personally breathe on the branch. This, the evolutionist has been attempting to explain for more than a century and a half and the creationist has largely closed their mind to. The creationist as a whole takes such a narrow unmovable view of creation, that they become self-defeating in their efforts. They rob themselves of one of the greatest joys that can be experienced as a believer in a creator. That is the realization of the awesome and immense power, wonder, complexity and wisdom of the one who created all that exists, ever has existed and ever will exist. Oh such a pity to walk around life with blinders on one’s eyes and the doors to one’s mind shut tight. that you seek to prove. Yet, just like the creationist, you too miss out on so many rewards from your labors by your strict adherence to a set of disciplines so long overdue for adjustment. You deal with the yet unexplained, yet fail to consider that some things may remain unexplainable. Your very logic dictates that it would be nonsense and to your downfall to profess to believe that something could appear from nothing, yet you stop short of admitting that there had to be an existence of some form to create the very thing that you seek to prove. Oh, and by the way, that Oak tree mentioned earlier that served as such a perfect example of the immense expansion and diversity of life on this planet and how all life forms came to be, with humans as the leading life form above all of the rest. It was cut down by humans in a dispute over whether or not it was worthy to be saved, after it was infected by insects that were introduced by other humans, from a place that was carefully designed by the creator to keep it in perfect balance and harmony with all other life. No, the choice to choose either the right or the left is tantamount to choosing to place one’s self in restraints and a willingness to go through life with blinders on. To choose either the right or the left is to willingly choose to miss out on many of the benefits that the other can provide. Therefore, to choose either the right or the left is the wrong choice, while choosing to reject both the right and the left and choose to embrace both is the right choice. Somewhere along the way, logic and common sense have gotten lost and trampled under by strong emotion, lack of understanding and a lack of critical thinking. Science in and of itself is often imprecise and prone to error. This is a natural part of the process. Matters of faith are of one’s personal belief and while they are as real as anything else in on this earth, the realism that you perceive, is real only to the believer. It is not the job of science to prove that a matter of faith does exist. That is the job of the believer of that faith and to expect others to do what the believers of a faith have been commanded to do is a breach of that faith. It is the responsibility of both sides to follow the words of King Solomon: “The beginning of wisdom is: Acquire wisdom; And with all your acquiring, get understanding” (Ryrie NAS Bible, Prov. 4:7). This King of Israel, who is acknowledged in many writings by many peoples of many faiths, is professed to be the wisest man who ever lived on this earth and is a prominent figure in the Bible and Israeli history, which the majority of creationists espouse to follow. Yet, wisdom is most often sought only in so long as it conforms to what we choose to believe. True wisdom often resides neither to the left or the right. Creation created evolution and evolution supports creation. Creation proves that there is a creator who made something where nothing existed. Evolution gives us more reason for humbleness toward the greatness, wisdom, complexity and power of that creator. There is no contradiction in accepting both and embracing that which is true in both, for one supports the other; each one has its flaws, yet each one is equally true. Therefore, each supports the other as powerful allies. Yet there are those who will continue maintain a state of closed mindedness and choose to continue to go through life with blinders on, never seeing the beauty in the other side. This is a fact of life that cannot be changed. There is a saying from an Industrial Psychologist whose name I have long since forgotten. But his words ring true yet today: “My perception is my reality, and from my reality I shall not be swayed!” This is the bane of many people. The same creator that so many profess to believe in and worship, in any of the major religions, also gave each of us the ability to think and critically reason all that comes before us; yet it is the choice of so many to set this one gift that sets us apart from all other life on this planet aside and go through life in stubborn closed-mindedness. This brings us full circle back to where we first began. The world attempts to force us as individuals to choose the right or the left, which often creates even more problems and contradictions with either decision made. The true mark of maturity and critical thinking is to rise above and beyond the simple choices of the right or the left and first view the entirety of each and then choose a position of truth based on the best evidences of both sides which is usually in the middle. Sometimes, the hardest decision to make is to reject the idea that the only decisions that can be made are right or left, but this does not come without cost as some creationists and evolutionists alike are finding out. Those on both the right and the left will reject those who break ranks and dare to question the traditional beliefs of their peers. But those who do are increasingly coming to the same realization that there is no conflict between the two sides when embracing both. Therefore, do not allow yourself to be robbed of the fullness that can come from refusing to be conformed to the right or the left. Dare to explore both sides of the issue and draw your own conclusions based on the evidences presented in both sides of the issue and never be content with simply accepting the teachings of others as the only choice to accept. We must trust those who attempt to instill in us wisdom and moral values, but there is much wisdom in the old saying: “Trust, but verify” (Trust). Personal survey conducted as a part of a persuasive writing assignment for ENG-101 from April 24-May 8, 2011. The survey was placed on an outside form service for the sake of anonymity and security. The results were emailed to the author. Limited numbers of the survey were also conducted among school peers. It is not known exactly how large a “Cubit” was at the time of Noah, but the best estimate is that a cubit is approximately 18 inches. Therefore, the ark described in the Bible only contained 2,278,125 cubic feet of room arranged in three decks and a gross tonnage of roughly 14,000 tons. This is just over 1/3 that of the “Queen Mary”. This book is still available in print in the libraries of some of the major universities and major libraries, which is where I first found it. It is best referenced as an online publication with corrections. Charles Darwin, 12 February 1809 – 19 April 1882, born in Shrewsbury, Shropshire, England. Antonie Philips van Leeuwenhoek, October 24, 1632 – August 26, 1723, is commonly known as "the Father of Microbiology", and considered to be the first microbiologist. He is credited for the discovery of microbes. Louis Pasteur, December 27, 1822 – September 28, 1895, is remembered for his remarkable breakthroughs in the causes and preventions of diseases. His discoveries reduced mortality from puerperal fever, and he created the first vaccine for rabies and anthrax. His experiments supported the germ theory of disease. He was best known to the general public for inventing a method to stop milk and wine from causing sickness, a process that came to be called pasteurization. Jonas Salk, October 28, 1914 – June 23, 1995, created the first Polio vaccine in 1955. Trust, but verify was a signature phrase adopted and made famous by U.S. president Ronald Reagan. Reagan frequently used it when discussing U.S. relations with the Soviet Union. Reagan rightly presented it as a translation of the Russian proverb "doveryai, no proveryai" (Russian: ?????? ?, ?? ????????). Wikipedia Foundation. 5 May 2010. Web. 25 April 2011. “The March of the Giant Ants.” History In The Headlines. Ryrie New American Standard Study Bible. Chicago: Moody Press, 1978. Print. “Trust, but verify.” Wikipedia. Wikipedia Foundation. 28 April 2011. Web. 5/1/2011. © Copyright 2019 the Hillbilly Gardener. All rights reserved. Risky sports, what is indeed behind?